Volcanic hazards maps are recognised as a crucial tool in communicating risk between scientists, government institutions and vulnerable communities. This risk is composed of hazard, exposure and vulnerability; all of which contribute to risk mitigation recommendations. Society is in need of a systematic approach to estimate and compare environmental and anthropogenic impacts that affect large geographic areas. 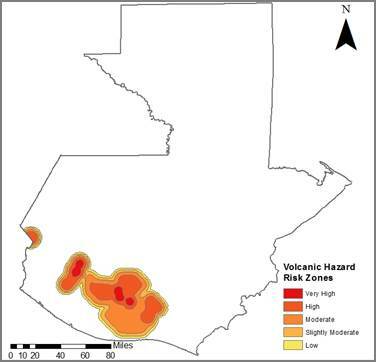 Conventionally, volcanic hazard maps are created at a local scale, with a single volcano under assessment; however, this study will aim to develop a regional scale volcanic hazard map for the Central American country of Guatemala. Seven volcanoes were chosen based on the availability of data regarding past eruptions and include Tacana, Santa Maria, Almolonga, Atitlan, Fuego, Acatenango and Pacaya. 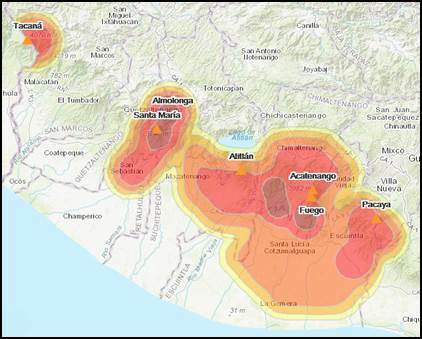 Four volcanic hazards were identified to cause to greatest wide ranging impacts in Guatemala, which include tephra fallout, lahars, lava flows and sector collapses. 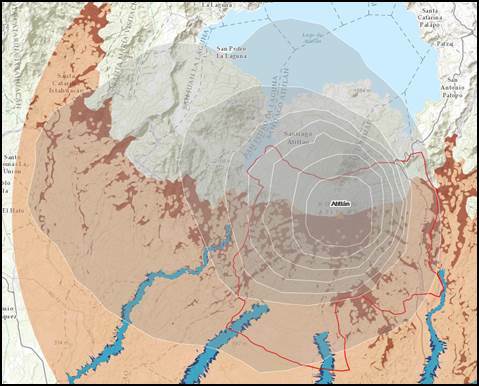 Valuable hazard extent data was provided by INSIVUMEH and therefore some volcanoes did not need new assessments for lava flow and sector collapse hazards. TephraProb is the toolbox of choice within this study, which uses Matlab functions and the TEPHRA2 model to create scenario-based probabilistic hazard assessments for ground tephra accumulation. The program allows for automatic download of NOAA (National Oceanic and Atmospheric Administration) wind data, analysis of this wind data, direct access to GVP (Global Volcanism Program) data and integrated use of the TEPHRA2 model. From wind analysis and knowledge regarding VEIs (Volcanic Explosivity Index), scenarios were developed to simulate tephra dispersal following a 10 km, 15 km and 20 km eruption column, within both the dry (November to April) and wet (May to October) season. Left: Atitlan tephra dispersal following an eruption with a 15 km eruption column in the dry season. Right: Atitlan tephra dispersal following an eruption with a 15 km eruption column in the wet season. 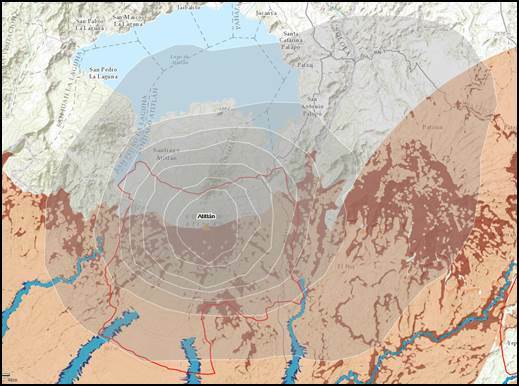 The USGS LAHARZ program is the model of choice that automatically maps the probable lahar hazard zones during or after a volcanic event. 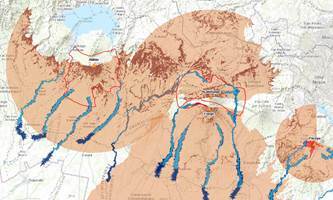 The tool box can be added into ArcMap, where DEM data is required as an input of the program, along with lahar volumes to provide an automated map of potential lahar inundation. Two input volumes of water were used to create scenarios of lahar hazards following an eruption, during a period of high rainfall intensity. Lava flow hazard assessment is only required for two volcanoes, Atitlan and Acatenango. Data for past lava flows at Atitlan and Acatenango does not exist and therefore literature was consulted to determine a lava flow hazard zone. A report by USGS stated that lava flow hazards at Atitlan volcano have not travelled more than 7 km from the vent source and no more than 10 km at Acatenango. 10 million (Light blue) and 30 million (Dark blue) cubic metres of water. Atitlan, Acatenango and Fuego all required sector collapse hazard assessment. Literature was a valuable source in composing a useful method. Literature revealed that debris avalanches generated by sector collapses would not typically travel more than 30 km at Atitlan, 25 km at Acatenango and 50 km at Fuego. For dry materials, the angle of response can lie between 30 and 45 degrees, however the input of water can increase this angle due to the surface tension between water and the material. Therefore the slope angle highlighted within this study is set at 30 degrees +, acting as a lower boundary for identifying steep slopes. With all volcanic hazard determined for each volcano under study, thought is now made into the way in which these hazards can be amalgamated to show regional scale visualisation. Areal interpolation is the method used for the process of estimating values of one or more variables in a set of target polygons. This method was used to interpolate hazard extent polygons, to produce a continuous output that represents hazard risk. 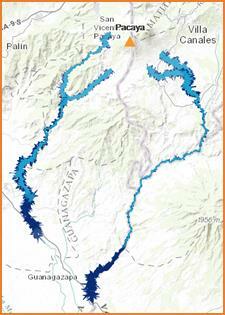 VulViz is an interactive mapping tool used to display volcanic hazards at various scales in Guatemala. This tool was developed because of the need to better understand volcanic hazards at various scales. A greater understanding ultimately leads to enhanced hazard mitigation strategies and more importantly can save lives. By searching through this tool, it is possible to visualise these hazards at a regional scale and at a local scale. This study initiates discussion into the idea of regional scale volcanic hazard mapping. As this subject is in its primary stages of development, this project hopes to spark discussion and provide an example of what can be achieved when moving away from the conventional, local scale volcanic hazard map. A wide variety of methods are currently used in generating hazard maps and it is important to acknowledge that one model cannot fit all situations. Methods for producing a regional scale volcanic multi-hazard map do not currently exist. It was therefore initially challenging to develop a new method, that would be both simple to implement, considering the time constraints, yet scientific in its approach. The areal interpolation method used within this project is innovative in its use for this subject and successfully produced a continuous surface of volcanic hazard risk. The figure below displays the resulting layer of areal interpolation and indicates 5 areas of risk severity. The highest risk is located around the vents of Almolonga and Santa Maria, due to the very large population living within 10 km of the volcanoes and also the high VEI 6 figure for Santa Maria as designated by the Global Volcanism Program. 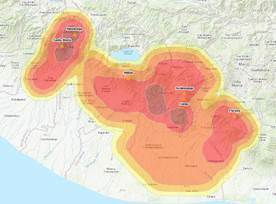 The areas to the south and east of Fuego are also designated high risk due to the numerous hazards that combine and overlap within these areas, from hazards generated by Atitlan and Acatenango. Tacana experiences no very high risk due to the low population living within 10 km. It is clear to see that the interpolated layer successfully manoeuvres the extent of the hazards, while incorporating the element of risk through population and VEI. An effective hazard map is quantitative, accountable and defendable. VulViz is therefore defined as effective. It is quantitative through its involvement of four different volcanic hazards at seven volcanoes, at both regional and local scale; accountable through its clear discussion of model simulation uncertainty and limitations; and defendable through its clear justification of every decision made.